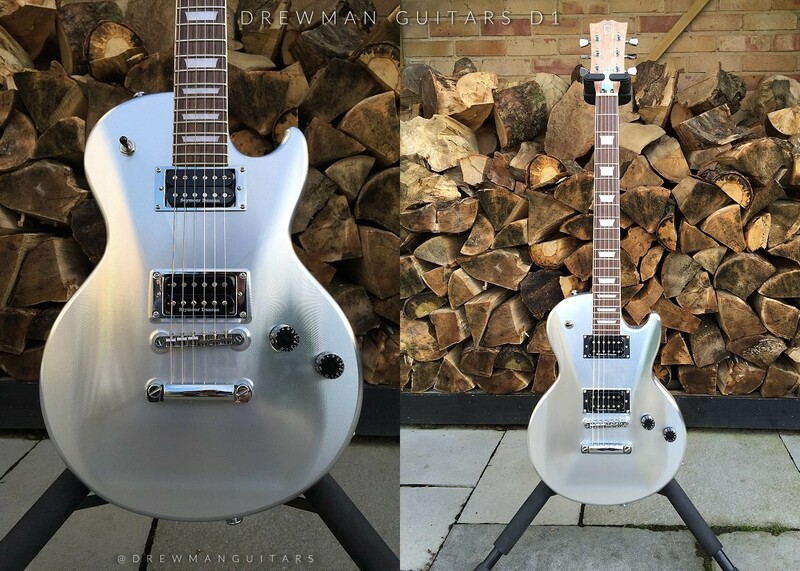 Drewman Guitars is the first brand of aluminium guitars that we have in Soundpeers. The exquisite design and the beautiful ‘radial burst’ archtop finish in the D1 model sparked our curiosity to learn more about these guitars: the manufacturing process, the materials and the company. A few days ago, Andy, the man behind Drewman Guitars, kindly answered some questions for us. Q. The company started in 2015, what was the motivation to embark upon Drewman Guitars? Our vision was always very clear; we wanted to experiment with the tonal qualities of high grade Aluminium when coupled with extremely precise engineering and the classic curves all guitarists have loved for over 60 years. Q. As stated in your website, aluminium guitars emerged in 1890’s. How does the manufacturing process and materials differ from then? Well, the purity of the raw product is probably not that much different than it was back then BUT access to computer controlled milling machines and CAD modelling has made the process more aligned with the Aerospace sector than anything else. 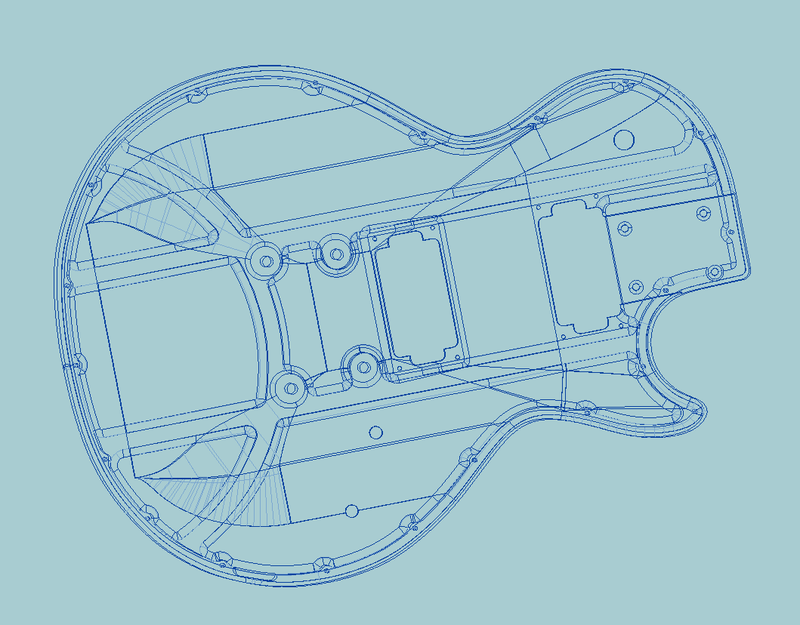 We use the same machines to sculpt our hollow-body arch-top guitars as are used for specialist part production for Ferrari and Airbus industries, not very musical I agree, but it ensures we deliver identical tonal resonance with each body we produce AND everything fits perfectly. We call it “built in quality control”. Q. How long did you spend developing the D1 model? Months! From initial ‘back of an envelope’ sketches to first draft CAD, 3D modelling [where you could fly through the pick-up holes and look inside the body cavity] through to initial prototyping and then testing the first run production model, Months! Q. There are several companies working on aluminium guitars, how do you see the market? There are lots of brands out there that try this, some are beautiful to look at, some are not! some are very micro-phonic, some feedback, some don’t. I know that this is a very small segment of the market and we don’t want to change the world but we do think that there is space for us all and if we all keep innovating and enjoying the process, why not! Q. In your opinion what are the benefits of aluminium body instead of wood? Quality of finish; I love the way it feels, it’s different from a maple quilt top [not better, different] but the main benefit is the resonance and the sustain, we get great results in this department and it’s a joy to listen to. Q. How would you define the tone of an aluminium guitar? It’s not harsh, cutting or extreme, it’s jazzy when rolled back, it’s grunty when driven hard; dig in and get those punchy mid-tones. It’s got bass when you play those BIG power chords too! I like to hear that mid-driven blues tone come through and it does that very well. Q. Are you working in order to expand your product line? Yep! the D2 double cut is on the [virtual] drawing board but I’m not throwing loads of time into that right now, the D1 is the main focus. Q. What benefits do you think Soundpeers can bring to your business? Soundpeers seem to want to get behind the brand, innovation seems to excite them and new stuff always sparks the imagination, I think that Soundpeers could help with that push that us small producers really need out there where we’re competing for survival amongst some pretty scary competitors! 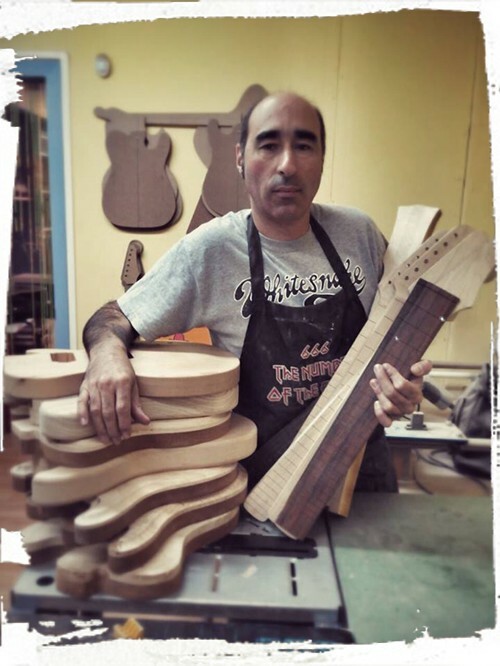 Francisco Rodríguez is the man behind Franfret Guitars, an outstanding handmade guitars brand from Galicia, Spain. Amazing designs, great materials and a deep inside knowledge are the ingredients that this luthier mix with passion in order to get The Real Custom Concept. At Soundpeers we had an interesting chat with Francisco where he explained many of the secrets of this fascinating occupation and the elements needed when manufacturing his guitars. We had time to perceive how much he gets involved into each of their guitars every time he works in any of his masterpieces. Q. Fran, your motto is “The Real Custom Concept”. Can you explain us what this means for you? To be honest I didn’t choose this slogan myself. The idea came out after a client, who owned several brand name guitars and a Fender Custom Shop, decided to buy a new one following his own specifications. When he tested the new guitar, he concluded: “it’s not the same a T-bone steak than a hamburguer”. After that experience, he decided to sell all his guitars and continue working with Franfret. In my opinion, “The Real Custom Concept” means that you can do whatever you want when you follow a criteria and you are coherent. As a musician you can get the instrument you desire and participate in the whole creation process. I always show the project evolution to the customer considering this a very important part of my job. Q. I believe that manufacturing one of your guitars from the scratch involves a lot of working hours. How much time do you devote to each part in the process? Creating a new guitar usually takes me between 90 and 100 hours in average. Of course that depends on the kind of instrument, it’s not the same a bolt-on neck than a glued one. The finish touch also affects time. When talking about the different phases, I always start with the design. I create the plan in 1:1 scale with a pencil and paper (I don’t use any computer software). In this phase I get myself inside the guitar, focusing in each curve. Afterwards I prepare the templates for the body, neck, cavities and so on. I always count on a wide stock of woods for my guitars and I personally choose specific pieces to my custom models, depending on cut, weight and appearance. Q. Which components and brands are you usually using in your guitars? I use Gotoh machine heads, ABM or Hipshotbridges and CTS and Switchcraft electronics. The pickups I choose depend on the sound I want to get. All of them are handwound: Haüssel, Bareknuckle, Gemini and currently B&B pickups(manufactured in Valencia by Pascual Brisa). I have a wide stock in woods, including mahogany, oregon pine, ash, hard maple, flame maple, walnut and blackwood. Q. Which one would you say is the most important factor in a guitar considering sound? There are plenty of them, we have so many variables in a guitar that people can’t just imagine. Woods, pickups, neck deviation, kind of bridges, strings and many more. I consider that the heart of a guitar is a good neck joint. The neck must fit in the body cavity creating a perfect transmission regardless of the kind of neck (bolt-on or glued). Q. When someone asks you for a custom guitar, what do they usually demand? What does a customer look for when escaping from commercial brands? Well, the first question is always about the price! From that point they decide if they continue or not. People look for something personal and unique, an instrument which adapts to their needs. These people know that they will get a handmade and unique piece, creating a clear added value. In my experience I’ve seen everything, guitarists with a great sound and a medium class guitar, lovers from big commercial brands… It’s very difficult to find “your guitar” and “The Real Custom Concept” means something additional. I always leave a piece of myself inside every guitar. Q. Can you name some artists who use your guitars live or in studio? The main ones are Oscar Rosende, Antonio Abad and Fernanzo Abenza, guitar players and bass player from the band Brothers in Band, a tribute to Dire Straits. In 2016 they are touring through Spain, Germany and France. I created replicas of some of the Mark Knopfler and Guy Fletcher guitars. For this tour I created a replica of the well-known Schecter Knopfler guitar. We have recently endorsed Fenris, guitarist from the original and promising band Bloodhunter. He acquired our Vento Deluxe model and he said literally: “it’s the best guitar that he has ever played”. Q. Are you currently working in some new projects? Sure, I’m working in two new models made of walnut for the AXE series. Besides that I’m doing custom orders which are usually guitars with a classic cut. Myself and Fran from XTONEBOX are collaborating in a new very interesting project. He has a great sense of design and being from the same region, everything comes out much easier. Q. Few months ago you and other luthiers started out the Contemporary Spanish Guitar Builders association. What is your goal? We have created CSGB because we consider that it is a must. We all need to stay together and offer our clients a qualified and regulated service. Musicians fear to take their instruments to luthier studios because they might have had bad experiences in previous situations. With this association we assure that everyone has the proper education in the field, declares taxes and so on. Q. What do you think are the most important benefits that Soundpeers can bring you in order to consolidate your business? Mainly is about the projection of my work. I believe that this kind of initiatives are very advantageous for both sides, the luthier and the customers. Soundpeers is a showroom to the world. I would say that in this profession, our market is the whole globe. We have a huge window which is internet and we have the medium. Guitar and bass players from all over the world, welcome to Franfret Handmade Guitars!